Before I made the final big tank with ceramic, I made this one as a test with the same way. I need to make sure the method technically is working. The surface of the work shows it as a universe bubble that I want to keep it relatively dark. The inside shows the sky of the inner world, I applied lighter bluish glazes. There will be other works inside of the tank, in the same colour as the surface of the tank. Together, there is a contrast between them. 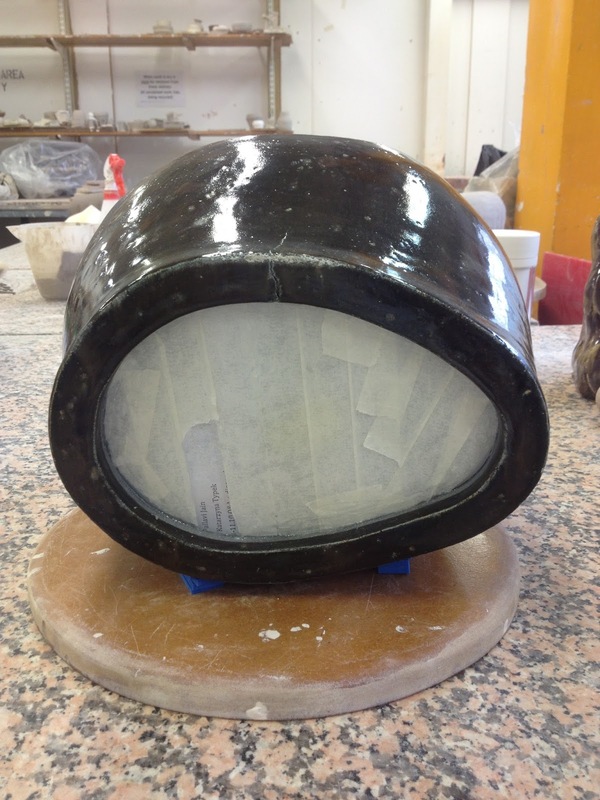 The next step after glaze firing is to get a piece of glass and glue it to the tank with silicone. Firstly I cut a piece of MDF and trim it to the right size. Then I bring it to a local glass shop where they can use the MDF as a template and cut the glass free handed. The glass itself, cutting and sanding together costed me about 18 pounds. Before I glued it with silicone specially for aquariums, I covered part of the glass with masking tape and paper so that the silicone won't mess up the glass. I glued the both sides to make sure the water cannot leak. After I cleared the cover and filled the tank with water. The tank worked. No water came out; the inside looks much better with the water inside. Though it is a shame that there is a crack on the top edge of the tank. Also due to the direction I fired, the worked collapse a little so that the front side was not flat enough to fit perfectly to the glass. Before I glued the glass on, I put the sand and other works in the tank to have an overview of the composition. I found the figures a too big for the tank, and more light is needed. The acrylic sticks are bigger than my plan. However, the tank will look differently with water inside, I will do the composition again and adjust the setting.